Inlifesize is a games company set up by former Electronic Arts (EA) Creative Director, Phil Campbell, and Industrial Light & Magic and Walt Disney Feature Animation alumni Greg Maguire. Yesterday the first game rolled off its proverbial conveyor belt. While I’m not massively into mobile games at the best of times, it’s difficult not to be drawn in just a little by Fairy Magic, which is a pretty stunning augmented reality game aimed squarely at children. But we’re all big kids at heart, right? Erm, right. Moving on. The team behind Fairy Magic has a pretty impressive story to tell themselves, with a collective experience extending to Lucasfilm, Pixar, and Digital Domain. This includes artists, developers and animators who have previously worked on Avatar and Harry Potter. To make the likes of Fairy Magic a reality, they developed a proprietary animation and augmented reality platform. 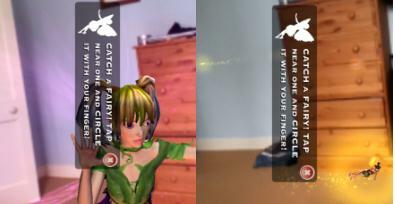 Fairy Magic enables kids to use their (your…) iPhone, iPod Touch or iPad as a lens through which fairies hidden in the real world can be unearthed. Players collect more than fifty unique fairies across seven different fairy clans, where they can discover their names, and play games with them. Fairies can be photographed indoors or outdoors, with the game-lighting adapting to the surroundings. You simply hold your mobile device in front of you, and you can catch fairies by tapping next to one of them and circling it with your finger. “Phil and I have both been fascinated by the changes in the consumer entertainment landscape brought about by the iPhone, and disappointed that so many independent apps trade off quality against ‘speed to market’ and production costs,” says CEO Maguire. Fairy Magic is partly funded by Northern Ireland Screen and the support of DCAL and the Arts Council.